Team projects can help students better learn course concepts and applications, develop useful communication skills, and engage in cooperative processes to tackle authentic problems. And, an additional benefit – according to empirical studies – students who work in teams outperform students who work individually. The benefits include practice in using higher-level reasoning skills, increased willingness to take on and persist in completing more difficult tasks, and greater engagement with aspects of intrinsic motivation (Johnson, 2014). Furthermore, these benefits extend beyond the classroom as the practices and skills put into practice through well-designed team projects help students develop important skills for community, career, and personal aspects of their lives. We know – empirically and personally – that successful team projects don’t just happen, that these projects require instructors take time for thoughtful advance planning, and continue their engagement with the project by advancing learner metacognitive and interpersonal skills throughout. To help faculty at both of these stages, we have created A Faculty Guide to Team Projects, a website resource that we outline in this post. Design an authentic task that requires both collaboration and distinct contributions. Share with students the purpose and benefits of their team project. Create teams that are heterogeneous with respect to knowledge, skills, and perspectives. Provide structure, time, and skill development training to your students. Share final team projects with the class and reflect on the outcomes. Create a project that is authentic. Authentic projects are relevant to students and reflect what a professional in the field might do. An example of this is asking student teams in a chemistry class to create a windshield deicer using available laboratory chemicals. Require collaboration and distinct contributions from each member. The project should be complex enough that a single student could not complete it alone and open-ended enough to benefit from the individual viewpoints, experience, and skills of each team member; for example, asking students in an international business class to research and develop a training session for doing business in a different country. Students come to our courses with many different types of experiences of learning within groups, accordingly their attitudes toward learning within groups will be shaped by the strengths and weaknesses of those previous experiences. To get students ready for the team-based learning in your course, it will be important to develop an understanding from the start about what shaped their ambivalent feelings and what spurred negative reactions when you initially announce a team project. A key part of this work is working with students so that they fully understand the purpose of the current project, and gain a sense of ways the project will benefit them now as well as prepare them for later course, community and career contexts. This conversation begins with you and students talking about how the project will help them meet course outcomes and with you helping students connect current work to future work. This is the time to also describe for them the support you will provide throughout the project, and to seek out what supports that particular groups of students might want or require. As you build your course, consider adding similar bits of information to your description of the team project in your syllabus. Team formation, the next step, can be a challenging one. Do you allow students to form teams on their own, or do you assign them? Whether you or students, or a combination of actors, sets up the groups, what factors should you take into consideration as you make your team-based learning plan? To help teams be successful, aim to create diverse teams with respect to student strengths and background (Oakley, 2004). Diversity can refer to culture, race, and gender; it also can refer to disciplinary backgrounds, and individual academic strengths and skills. Diverse teams have been shown to outperform groups of like-minded and/or similarly skilled individuals (Hong, 2004, Smith 2003). Having diverse teams helps spread skills and experiences more evenly across the groupings. Asking students to fill out an early in the course information sheet/survey is one way to gather information that will help in thinking about who will shape the groups, and how this shaping will happen. Effective assessment will include evaluating team output as well as individual contributions to the team and understanding. Assessing team performance by including feedback as part of the assessment plan throughout the project provides incentive for student groups to work together. 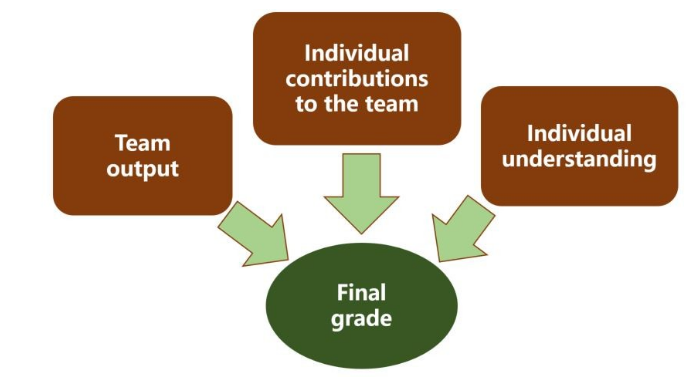 Evaluating and offering feedback about individual contributions to the team allows students to provide assessment regarding the relative contributions of their teammates, and of their own role/work as a team member. Assessing individual performance also provides an opportunity for each student to reflect on their own learning process and to demonstrate individual understanding of the material. Your assessments, whether of the work of individuals or the team, should be designed to measure and align with your learning outcomes, and your feedback throughout the process should support students working to meet the assessments you’ve attached to the project. When designing your assessments, ask yourself what evidence from students would demonstrate that the team and each individual can meet your learning outcomes. Also, consider the use of collaborative quizzes and exams as part of the assessment, as this will allow students to benefit from the knowledge and skills of their teammates. As students share feedback and practice self-assessment as part of the learning process, they learn about ways to work together (Kapitanoff, 2009). Effective teamwork doesn’t just happen. To begin the student support communication, let students know your expectations, and identify the role you will play as they develop their project. Let them know how you will be overseeing the assignment and clarify the extent to which you will provide support as they research and work together. It’s important to establish guidelines as to how and when they should contact you with questions and if problems arise. Ask students to spend some time discussing how they will work together including their expectations for each other before they dive into the project. You can provide them with a template to use and award points for the activity. You’ve worked hard and more importantly, your students have worked hard. If your team project lasted more than a few class sessions, it is beneficial to share the final products of each team with the entire class. This serves two purposes. First, this makes student work public, which can result in higher quality products. Second, it allows students to learn from other teams’ work. An example of this is to hold a poster session of student-proposed genetic engineering projects in a biology class. This is also a good time to collect student feedback on how the assignment helped their learning in the class. Ask about assignment logistics, descriptions, and faculty support to determine both areas of project strengths, and improvements that could be made in the next iteration. Having the project come to some sort of official conclusion, which should include a reflective element, can also result in students feeling more connected to the course material (Holmes, 2010). Holmes, M. H. (2010) Modeling team-development lifecycle in public administration courses. Journal of Public Affairs Education 16(1): 53-66. Hong, L. & Page, S.E. (2004) Groups of diverse problem solvers can outperform groups of high-ability problem solvers. Proceedings of the National Academies of Science 101(46): 16385-16389. Johnson, D. W., Johnson, R. T., Smith, K. A. (2014) Cooperative learning: Improving university instruction by basing practice on validated theory. Journal on Excellence in College Teaching 25 (3&4): 85-118. Kapitanoff, S. H. (2009) Collaborative testing: Cognitive and interpersonal processes related to enhanced test performance. Active Learning in Higher Education 10(1): 56-70. Oakley, B., Felder, R.M., Brent, R. & Elhajj, I. (2004) Turning student groups into effective teams. Journal of Student Centered Learning 2(1): 9-34. Smith, K. & Imbrie, P. K. (2003) Teamwork and Project Management. McGraw-Hill, World Fairfield, PA.